The American Association for the Treatment of Opioid Use Disorders (AATOD) this year issued three landmark white papers on improving access to medication-assisted treatment (MAT) for opioid use disorders (OUDs). Funded by the Substance Abuse and Mental Health Services Administration (SAMHSA), the white papers can serve as guidelines for treatment providers addressing the opioid epidemic across the country. 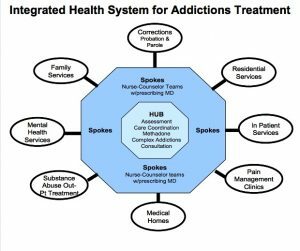 The first white paper focuses on two main types of integrated care using health homes for opioid treatment programs (OTPs): the “hub and spoke” model in Vermont, and the models in two states—Maryland and Rhode Island. Vermont’s model is widely viewed as the most progressive in the country, partly because of Gov. Howard Shumlin’s use of the Affordable Care Act (ACA) to expand medication-assisted treatment (MAT) with a combination of OTPs (hubs) and office-based outpatient treatment (OBOT) providers (spokes). 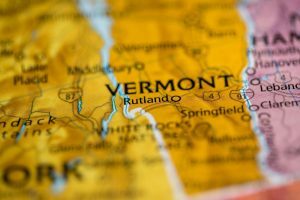 We focus in this article on the first white paper’s report on Vermont. “Models of Integrated Patient Care through OTPs and DATA 2000 Practices” is presented in three sections. The Vermont section was written by Karen L. Casper, PhD, and Anthony Folland, Clinical Services Manager, Vermont State Opiate Treatment Authority, Vermont Department of Health’s Division of Alcohol and Drug Abuse Programs. Lower operating costs will offset the significantly higher cost of buprenorphine compared to methadone. And the decision about which medication to use will be based on the clinical needs of the patient. The coordination of care—the “health home” aspect—will be paid by a Medicaid waiver under the ACA. Medicaid health homes were established by the ACA, under which states can reimburse agencies for care coordination. For OTPs, this means that the Centers for Medicare and Medicaid Services (CMS) can pay them extra to help patients manage physical and behavioral problems, in addition to their OUDs. Collaboration between OTPs and DATA (Drug Abuse Treatment Act) 2000 practices that prescribe buprenorphine is an essential part of integrated care, all three papers suggest. In Vermont, this coordination is clear, with the OTPs serving as “hubs” and the DATA 2000 practices as “spokes.” The hub can refer patients to the spoke, and vice versa, so the patient can be in the most appropriate treatment. Methadone and buprenorphine are the primary medications used in Vermont to treat OUDs. They are used in conjunction with counseling. Vermont’s “hub and spoke” initiative aims to improve care at reduced costs for the state’s health system. This works, for several reasons. Buprenorphine use is expanded in both hubs and spokes; the system is flexible enough to allow patients to transfer between OTPs and OBOT programs, as clinically indicated; and creative payment methods support enhancements that hold the hub-and-spoke system together. Spokes must employ one full-time nurse and one full-time licensed clinician case manager for every 100 patients being treated with buprenorphine. Staff are hired or contracted by the state’s Blueprint for Health program. For OBOT practices with fewer than 100 patients—most of the practices, as of this writing—several practices can share the support staff. The success of the hub-and-spoke solution relies on expanding the use of buprenorphine in OTPs. This is a sea change for OTPs, previously exclusively methadone clinics. Now, OTPs can prescribe buprenorphine—and no other state uses as much buprenorphine as Vermont. The first question is “How can this be cost effective?” Buprenorphine is much more expensive than methadone. The answer is simple. The patients won’t stay in the OTP. When an OTP starts patients on buprenorphine instead of methadone, the patients can be transferred to OBOT once they are stable. For those patients, the high costs of OTP that are unrelated to the cost of methadone would be avoided. OTP clinicians would determine which new patients would be best for methadone treatment, and which for buprenorphine. So far, about one-third of patients move out of OTPs after stabilization on buprenorphine. Additional cost savings are also expected as a result of fewer unnecessary emergency department and hospital visits, as well as fewer social and legal costs. While it may sound easy to be able to refer patients between OTPs and OBOT physicians, it isn’t. The first step involved developing a “referral culture” to replace the previous “capacity culture,” based on a fee-for-services billing model. If OTPs are paid by the patient, what is the incentive to refer to an OBOT? The state helped this process by paying for discharge planning and referral, and for requiring health home encounters as one of the reimbursement criteria. The model also provides for the OBOT to refer the patient back to the OTP if necessary, which requires a sophisticated process for bidirectional movement—referrals from OTP to OBOT, and from OBOT to OTP. Creative new uses of Medicaid include case rates, combined funding streams, and capacity-based payments, rather than fee-for-service. Vermont will collect federal matching funds ($90 for every $10 spent by the state) only for the hub-and-spoke costs directly linked to providing health home services. The remaining services are matched at the current federal-state rate of 50-50. Spoke payments are based on the average monthly number of unique patients in each health savings account for whom Medicaid paid a buprenorphine pharmacy claim during the most recent three-month period, in increments of 25 patients. Most MAT funding is through Medicaid, but some patients have third-party insurance. Medicare will pay for treatment in spokes, but not in hubs. Footnote: The total number of people receiving MAT services through the hub-and-spoke system since the program’s inception has increased by more than 50%. The hub system has significantly increased caseload—from 650 patients in 2012, to 2,723 in 2015. The spokes have not grown as fast as the hubs: from 1700 patients to 2143 during the same period.